Have an attitude of gratitude! Feeling and showing gratitude can improve our lives in so many ways and increase our feeling of overall happiness. And the best part is that cultivating gratitude costs nothing and takes minimal time. It’s easy to make simple changes in our lives to show gratitude and improve our overall well being. If you want to increase your happiness with gratitude, read on! 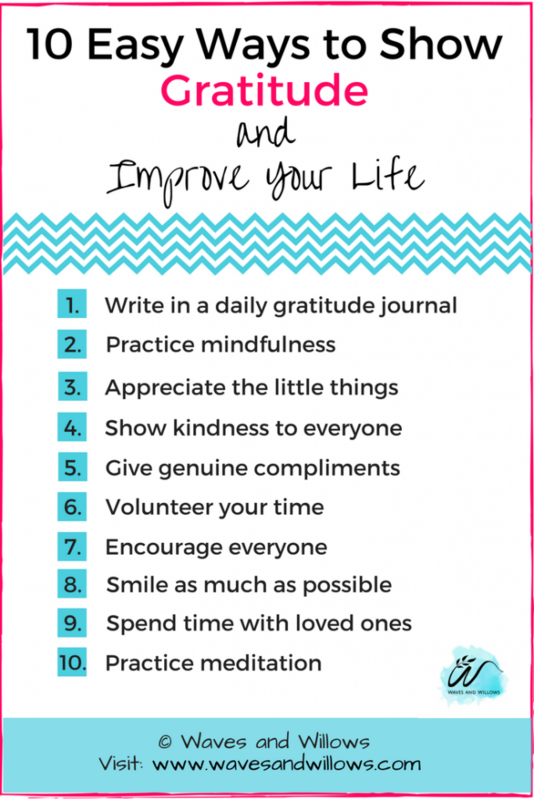 Below are 10 easy ways to show gratitude and improve your life! 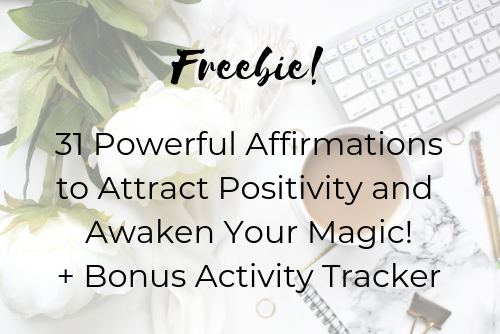 And don’t forget to download your FREE DAILY GRATITUDE JOURNAL! Practicing gratitude is a subtle shift in our mindset that can truly transform our lives in a positive way! The word “gratitude” has many definitions including simply “to be grateful”, however gratitude isn’t just an act of being thankful. It’s an emotion or true appreciation that we can feel and cause others to feel by our actions. I love this definition because I believe that gratitude isn’t just an action, like saying thank you when someone passes you something (though that’s important too)! To me, gratitude is an emotion that we genuinely feel and an attitude that we adopt. And it’s those deep feelings and grateful attitude that can improve our lives! Studies have shown that living a life full of gratitude can improve both our physical and mental health. 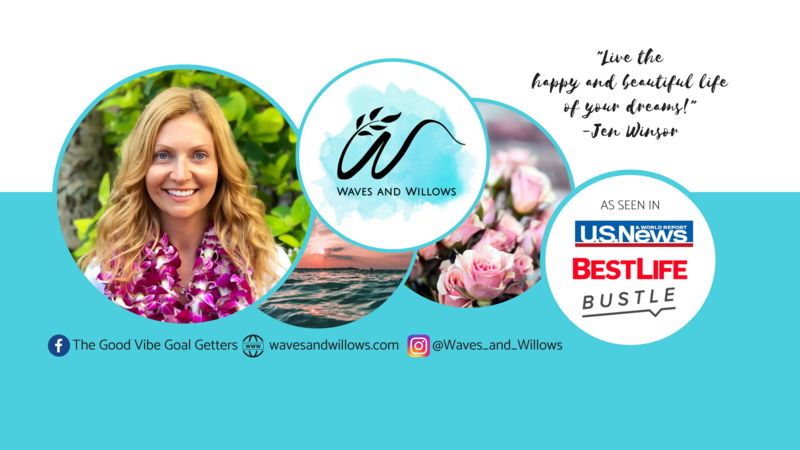 Gratitude is associated with having a greater sense of well being, greater life satisfaction, increased optimism, better sleep quality and improved relationships. Now who doesn’t want that? Feeling grateful is such a positive emotion and in my books, positivity is one of the key components to living a happy life! So now that we know that gratitude can improve our lives, let’s take action! Below are 10 easy ways to show gratitude, feel grateful and improve your life. This is number 1 for a reason! Taking even a few minutes every day to write down 3 to 5 things that you’re grateful for can dramatically improve your mindset and improve your life! The positive difference I personally experienced by starting a daily gratitude journal is amazing! I find myself being more present and mindful, and I feel less concerned about some of the little things that used to bother me. I feel like I’m really adopting an attitude of gratitude! Download your free copy of the Daily Gratitude Journal and get started today! Going hand in hand with mindfulness is appreciating the small stuff. Whether it’s the beauty of the sky/trees/sunset around you, the feeling of warmth from your clothing, or the extra kiss from a loved one. Take time to notice it and appreciate it. One of my favourite quotes is “Kind people are my kinda people!” and it’s so true! Being kind to others feels good and fosters a positive environment. And let’s be kind to ourselves! That negative self talk needs to be tossed to the curb! If you’ve had amazing service somewhere or love what your friend is wearing or are totally impressed with your co-worker…tell them! We all love to receive compliments and giving them feels good! Let’s be generous with genuine compliments! Is there a cause that you’re passionate about? Why not volunteer your time to contribute to the cause? I’m a huge fan of volunteers and so thankful for everything that they do! Volunteering feels great and you can connect with others who share the same passion as you! I truly believe that by encouraging others, we help to build a better community and make positive change. Let’s encourage each other and celebrate the wins in life whether they’re ours or not. There is no easier way to boost your happiness than by smiling. 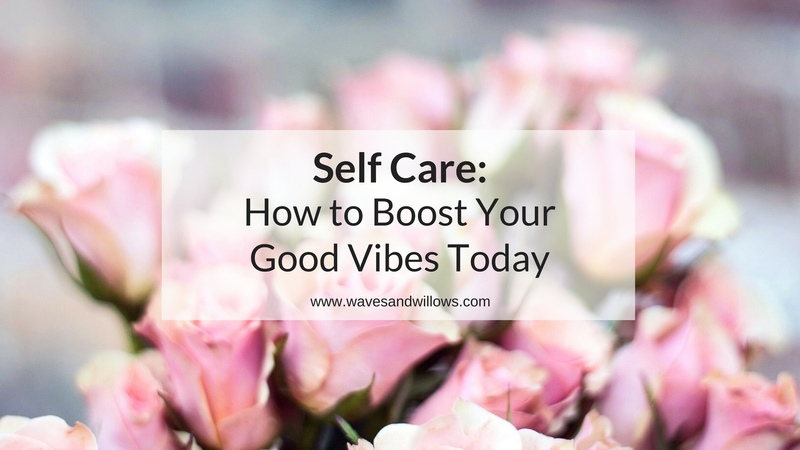 It’s even one of my 5 incredibly simple ways to feel happier in minutes! Because smiling affects us so powerfully and so positively, it also helps to put us in a perfect mindset to have an attitude of gratitude! So smile as much as you can! Spending time with the people (and animals!) that we love can boost our positive emotions and increase our feeling of gratitude. So whether you’re playing in the park with your dog, shopping with a friend, or sitting around a dinner table with your family…be present and grateful for it all. I’m a huge fan of meditation and wrote all about my first meditation experience here. 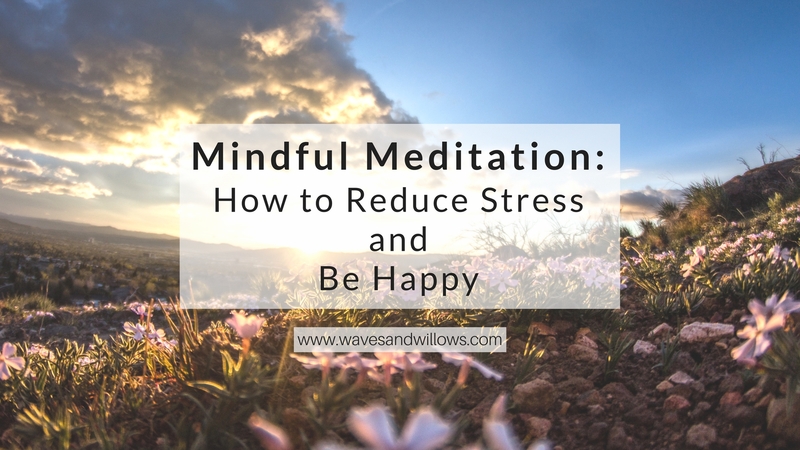 Because meditation can help to get rid of the “noise” in our minds and allows us to focus on what truly matters, meditation is the perfect tool to increase gratitude in our lives. Improving our lives by embracing an attitude of gratitude is easy to do! You can start cultivating gratitude in your own life today by trying one (or all!) 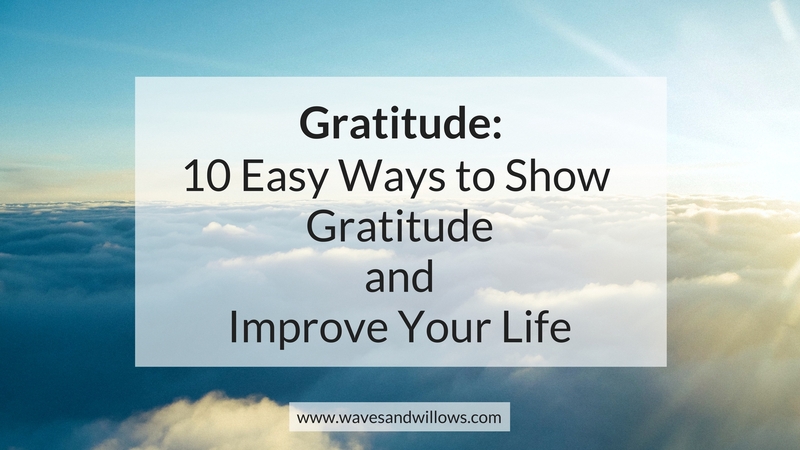 of my 10 Easy Ways to Show Gratitude and Improve your Life. In my personal experience, the #1 way to improve your life with gratitude is by writing in a Daily Gratitude Journal! So be sure to download your FREE copy of my Daily Gratitude Journal to get you started today! How do you show gratitude in your life? Let me know! Smile and voulenteer. My two favourite things to do. I think you can voulenteer your time anywhere and it brings so much joy! To the neighbours, elderly lady down the shops! There are so many kinds of voulenteering we can do and I truly believe giving is the key to happiness! Yes! I completely agree Stephanie! The more we give, the happier we become! Thanks for reading, all the best to you! Thanks Sarah! Yes! Showing gratitude to others allows us to feel grateful and appreciate more of our own lives. All the best! I really do believe in gratitude. I really do too! As time goes by, I realize more and more how important gratitude is in our lives! Thanks for reading! I believe all of these are super important to living a happier life. Thanks for the reminders! This great reminder to be grateful every single day! It is so important! Love this post. Thank you. Thanks Maja! I agree, gratitude is so important! I SO believe in this! I just started doing the Miracle Morning which includes doing 5 minutes of silence, and I choose to list things I’m grateful for. It’s a good way to keep things into perspective and to start off your day with the right attitude! I love that Chrissy! That’s the perfect way to start the day and get in the right mindset for a wonderful day! Thanks for reading! Love this. They’re all simple, yet powerful truths I’m trying to practice in my daily life. That’s awesome Herlina! Sometimes it’s the simplest things that can make the biggest impact! Thanks for reading! Completely agree with all of these! I’m working on all of them! Thanks Kathy! That’s awesome to hear! Thanks for reading! I really love that quote “SOMEONE ELSE’S SUCCESS IS NOT YOUR FAILURE”- people should totally help each other more!! Thanks Collette! It’s one of my favourite quotes because it’s so true! We should celebrate each others victories! Thanks for reading! I believe in this – i believe that if you are nice to people, people are nice to you back. Thanks for this post! I love this post! Thanks for the reminder. I try to keep a positive vibe going but some days can really test you. Thanks for sharing! I am very passionate about volunteering and it truly improves your attitude to give to others. Love this list. Thanks Brandi! Yes, some days can be hard for sure! You’ve got this though! All the best! That’s so awesome Lacy! Volunteers are so, so, important! Thanks for reading! I love your post! :) Thank you for emphasizing mindfulness. In an age of social media, it’s easy to forget the people who are physically in front of you are the most important people, and they deserve your attention. 🙂 I’m pinning this. I find that when I smile a lot it puts me in a good mood. Smiling is contagious! I read about this study awhile back that followed lots of people for 3 years. These people had to rate their happiness 1-10. Everyone was a 7. Get married? It’s a 10, for a couple months, then back to a 7. Get a promotion? It’s a 9 for a few months, then back to a 7. Lose your job? Be a 3 for a few months and then back to a 7. Then these same people had to use a gratitude journal had happiness levels that were consistently 7-10 at all times, even if they were going through a hard time. Appreciate makes all the difference. Great! Gratitude is so important! Thanks Christina! I agree! Mindfulness is so important, we can so easily get caught up in our phones! Thanks for reading and sharing! Absolutely! Smiling is one of the easiest ways to boost your mood! Thanks for reading! Thanks Sarah! I love that study example, I’ve read similar ones! Isn’t it amazing how something as simple as a gratitude journal can change our lives? Thanks for reading! 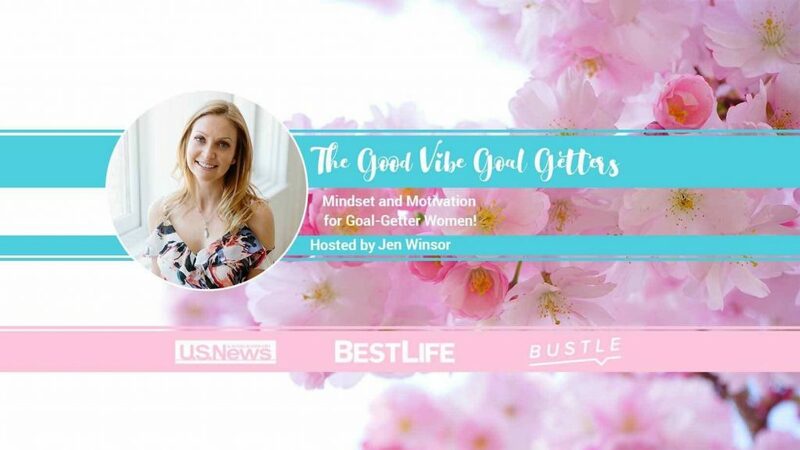 Great, positive post… thanks so much for sharing! It’s a great discipline to stop and think about how fortunate we are – it always helps to put things in perspective, especially during difficult times. Great tips! I need to focus more on actually DOING in the area of gratitude. Thanks Polly! I completely agree! Gratitude can make such a positive impact on our lives. Thanks for reading! Thanks Amanda! Definitely try using a gratitude journal, it really helps so much! Thanks for reading! Really enjoyed your post. 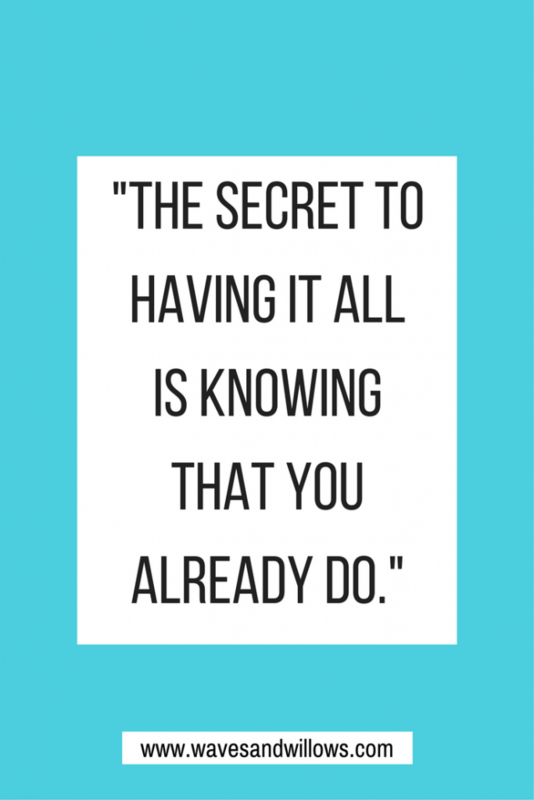 I don’t necessarily think of gratitude as something to “practice”, but after reading your tips, you are so right! It is something we can practice. Thanks for sharing! You’re welcome Maureen! I’m so glad that you enjoyed reading it! Thanks Tiffany! I’m so glad you found this to be helpful! All the best! Thanks Mily! I’m so glad you found it helpful! Thanks for reading! I love volunteering and I’m always encouraging others. Number 1, however, I should practice more. I never take time out of my day to write what I’m grateful for. This is a great post! Thank you! I hope you try out the gratitude journal! It’s an easy way to practice gratitude and make it a habit! Best wishes! Great read! I agree with ALL of these! It is easy to criticize, but harder to take a minute out and show some appreciation. Smiles are contagious! Gratitude is an amazing thing. Your words flew off the page and blew me away. Thanks Janeene! That’s so awesome of you to say! Thanks for reading! I do several of these! My favorites are to smile (a lot) and be kind to people. Volunteering in several capacities is also a big one for me. 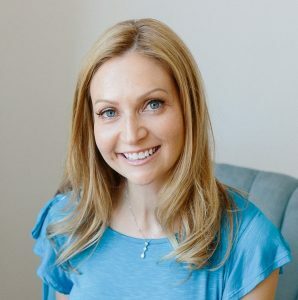 I love that you included a gratitude journal/list in your list of ideas! That’s another effective tool for me! That’s awesome Heather! Those are all super important! Thanks so much for reading! Love this!!!! I do several of these already and find it helps tremendously. I am still working on showing kindness to myself though. That can be a tough one! Thank you so very much for the excellent reminders !!! That’s awesome Jeanne! Thanks for reading! It can be a tough one for sure, but it’s so important. Keep at it! Thanks for reading! You’re welcome Lorna, thanks for your support! Thank you for this awesome post! I’ve been slacking off on gratitude lately and I really needed this to pick up my daily gratitude routine. You’re so welcome Ellen! I hope you’ll get your copy of the daily gratitude journal!